Joel graduated from Vacaville High School in 2000 and went to Sacramento State University on a soccer scholarship the following fall. After two years, he jumped at the opportunity to play professional soccer abroad. Playing a team sport at such a high-level instilled Joel with values of hard work, dedication, and accountability which he uses every day while working with his customers. After retiring from his Soccer career, Joel earned his real estate license and spent a year working for a large mortgage broker before opening Cornerstone with his mother, Carmen Rodriguez, in 2004. 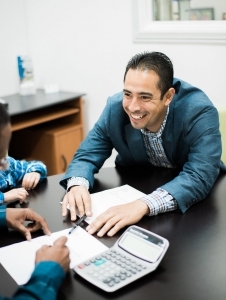 Joel enjoys listening to his client’s stories and gaining a deep understanding of their financial situation so he can work with them to build a quality mortgage application. He prides himself on staying current with program guidelines and lender offerings, so Cornerstone can help you find a bank that will close your loan. Carmen became a real estate agent in 1988 after watching her parents struggle to buy their first home. They moved to the United States when they were in their 60s. They spoke no English, and their realtor did nothing to help with the language barrier. She did not advise them of their legal right to ask for inspections or repairs, and also did not educate them on the best way to set up the title for a couple of their age. Today Carmen oversees the team at Cornerstone, ensuring that we offer a broad range of services to our clients so that we can meet as many individual needs as possible. She thrives on opportunities where she can resolve problems and achieve goals that exceed our clients’ expectations.